I watched and listened to a webinar yesterday on the Ithaka Faculty Survey report. The one hour presentation will eventually be archived at the bottom of this page, but it isn't there yet. But, if you want to see and listen to the discussion concerning how faculty feel about libraries, the discussion of Chapter 1 is there. This is a windows media file, .mwv. 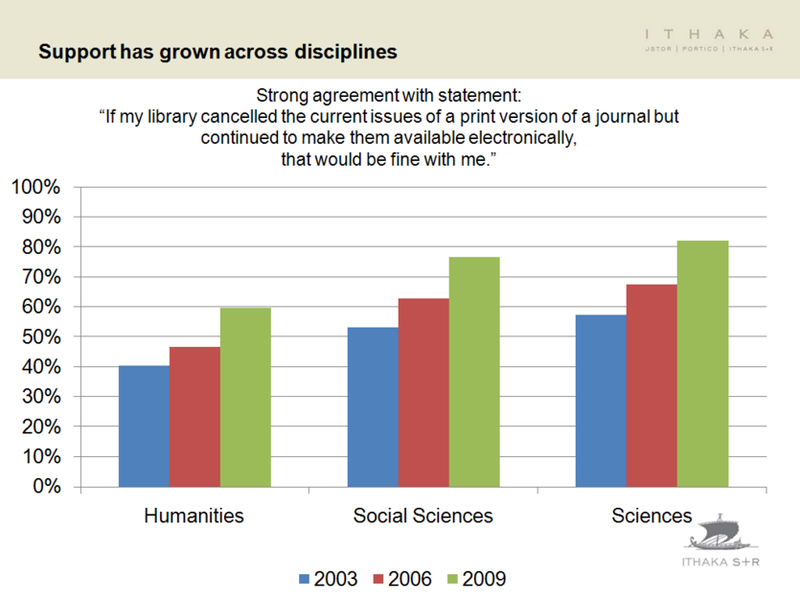 It was interesting to see how faculty are getting very comfortable with having electronic only access to journals. And, it is a growing trend for humanists as well as scientists and social scientists. At the end of the session, I made a comment concerning the fact that there are different levels of access. Faculty may not know that there are many levels and flavors of access. For example, do faculty really care if they access articles from a journal via the publisher or through JStor or through an aggregator like EBSCO? They just want the article, but to the library, it makes a difference. I will try to go to the discussion about Chapter 3 on May 5th ("Scholarly Communication" issues) but I might only be able to attend half of that session.